The Bronxville Historical Conservancy and the Village of Bronxville marked the one-hundredth birthday of President John F. Kennedy on May 29, 2017, by unveiling and dedicating a monument near the corner of Pondfield Road and Gramatan Avenue recognizing the Kennedy family’s residence in Bronxville from 1929 until 1941. Until that day, Bronxville had been the only Kennedy permanent or vacation residence that did not receive official public recognition. Bronxville served as the Kennedy family’s official residence for more than a quarter of John F. Kennedy’s life. Determining a location for the monument arose because Crownlands, the Kennedy family’s six-acre estate at 294 Pondfield Road, is no longer standing. The family home was demolished in the 1950s and subdivided before village residents realized it would become such an important place. After the United States Senate passed legislation in July of 2016 creating the John F. Kennedy Centennial Commission, the village registered with the commission with the goal of creating a means to recognize Kennedy’s residence in Bronxville. The Conservancy worked directly with the national archivist, as well as the John F. Kennedy Presidential Library and Museum, to create a fitting monument. 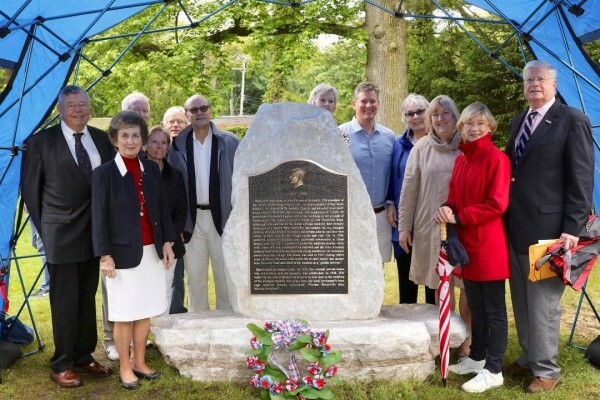 A further partnership led to the Village of Tuckahoe’s offering a piece of marble, chosen and polished by two local stonemasons, to hold the dedication plaque. Brick roads, adding much to the character and appeal of Bronxville, were built on the steepest parts of the Lawrence Park Hilltop, a National Historic District, early in the last century to provide more traction when going up and down the hill. Through the years, many have been paved over, but the Conservancy felt that these historic roads are such an important part of village history that we should make every effort to preserve the ones that are left. Brick roads not only add to the charm of the neighborhood, but also properly laid, last well over 100 years. 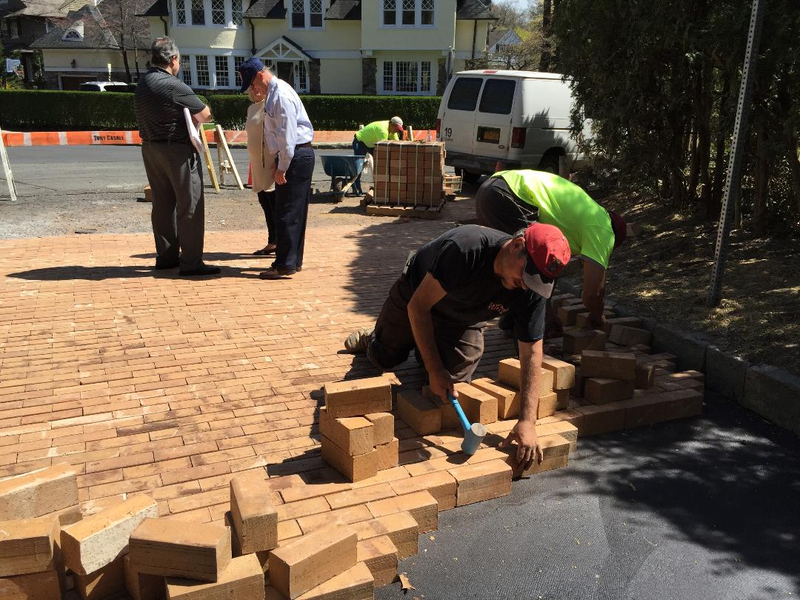 On September 8, 2014 Bronxville’s village trustees voted to approve the Conservancy’s request to restore and rebuild one of the village’s historic brick roads. The Conservancy agreed to buy and ship to Bronxville the bricks required to restore the road in return for the Department of Public Works installing the brick roadway. The restoration on the portion of Park Avenue that leads down from the Hilltop — running eastward from Wellington Circle down to Tanglewylde Avenue — was completed in June 2016. 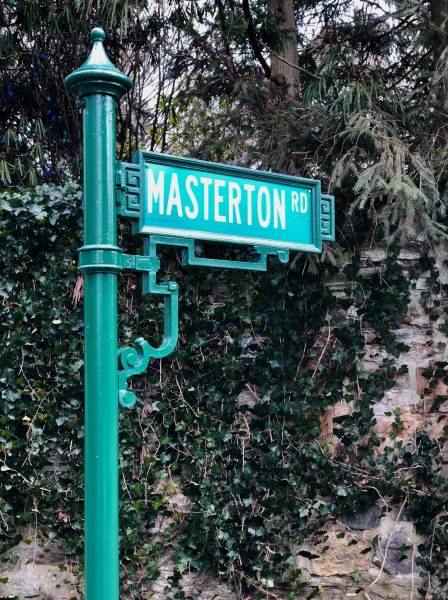 Bronxville’s iconic, architecturally distinctive and historically significant street signs have been restored to a standard not seen since their original design and installation in the 1920s. This achievement represents an excellent example of the Bronxville Historical Conservancy working with the Village of Bronxville to provide both historical architectural advice and a portion of the financial resources to conserve Bronxville’s history. The initial discussion of installing the street signs originated more than 100 years ago and lasted more than a decade. The original signs, many of which are still standing in the village today, were ordered late in 1926 from the Municipal Street Sign Company of New York and erected in the spring of 1927. Identifying a company with the capability to fabricate and restore the signs to the quality of the originals was the project’s biggest challenge. After a great deal of research by Conservancy board member and architect Anderson Kenny, the village placed an order with Wainland’s Inc. in Astoria, N.Y., to custom fabricate and finish the five to eight pieces each street sign requires. The Conservancy paid for the cost of the molds and Kenny worked closely with the fabricator and village personnel to ensure that the architectural integrity and design quality of the finished product faithfully replicates the original street signs. In the fall of 2013, the Conservancy awarded $10,000 in funding to become the exclusive sponsor of the Eastchester 350th Anniversary Celebration’s K-12 Educational Program. The following school year, students in Eastchester, Tuckahoe and Bronxville — public as well as parochial and private — had the opportunity to learn local history: that the town’s roots go back to the Eastchester Covenant of 1665; that the marble quarries drew many early European immigrant workers and their families to the town; that world renowned artists, authors and celebrities have lived here; that the first president of the United States to serve as a Boy Scout did so here; and that the town has been home to four Congressional Medal of Honor winners, as well as countless brave soldiers who served in all the country’s wars. In addition to exploring these topics, the town’s youngsters were challenged to select a history project of their own. They were asked to produce an essay, an artistic composition, a film or video, a poem, a drama or a mixed-media piece focused on this rich past. Older middle and high school students also developed research subjects into scholarly papers that revealed even more of the town’s unsung history. Read more. Both the main and south entrances to the Women’s Club of Bronxville, where many a young man and miss have trotted inside for their dancing and etiquette lessons with Miss Covington — now Miss Barclay — are graced once again with lovely lighting fixtures, thanks to the Bronxville Historical Conservancy. Financing the restoration of the original fixtures was a tribute to the 80th anniversary of the clubhouse and in recognition of its placement on the National Register of Historic Places. The project involved the removal and installation of temporary lighting, as well as the rewiring and structural restoration of the fixtures. This successful lighting restoration was accomplished to conform to the original building design of Penrose Stout. The Bronxville Veterans Memorial website features a list of more than 1,500 men and women from the Bronxville area who have served or are serving our country today as well as a collage of historic photos from WW I and II. It also has an interactive search capability allowing users to look up individual names as well as sort by those who have served in a particular war or branch of service. Where available, veterans’ personal stories, photos and experiences are included. This interactive capability allows all generations to connect with their families,’ friends,’ and neighbors’ past. The goal of Bronxville Veterans Memorial (BVM), which was founded in 2008 and financially supported by the Bronxville Historical Conservancy, is to help restore the original meaning to Memorial Day by honoring the local men and women of the U.S. Armed Forces who have served and are serving our country today. This dedicated website is intended to serve not only as a remembrance but also as a thank you to all those men and women. For further information, contact Jane Staunton at info@bronxvilleveterans.org. When Bronxville resident Renee Byers learned that graceful wrought-iron lamps once spanned the granite columns at the two main entrances to Avon Road, her thoughts turned toward re-creating history. With help from the Village Historian Eloise Morgan, Renee found the originals in bits and pieces in a cob-webbed corner of the Village Hall basement. Turning to the Bronxville Historical Conservancy for funding the effort, along with support from the Village of Bronxville, Renee embarked on the ambitious project of creating near-exact replicas, and on January 21, 2003, the lanterns were back in place, once again gracing the stately granite columns on Avon Road where it intersects with Midland Avenue and Sagamore Road. Re-constructed by Jozef Witcowski of Jozef Custom Ironworks of Bridgeport, Connecticut, the approximately 18″ high and have an antique bronze finish. With electrical connections and 3 candelabra bulbs, the fixtures will shine nightly, in concert with the village street lamps. The Bronxville Historical Conservancy fully funded the fixtures’ re-creation, installation and electrical work at a cost of approximately $50,000. When lack of a sound system gave a whole new meaning to “Silent Night,” the Conservancy researched a way to help the community with its nearly 100 year old holiday tradition. It purchased a new audio system for use not only by the Pageant, but for other civic organizations and events, such as Memorial Day. The Conservancy also created a booklet documenting the history of the Pageant. Thanks to the granddaughter of architect Harry Leslie Walker, a scale model of the Bronxville Public Library dating from the time of its original design has been donated to the library. After 60 years the model was in surprisingly good condition, but needed restoration which the Conservancy funded so that the model could be showcased in the Bronxville library as a reminder of its origins. The Conservancy has provided a variety of support to the Bronxville History Center and the work of the village historian. Among these were funds to equip the History Center, located in the lower levels of the Bronxville Public Library, with a state-0f-the-art computer and copier/printer/fax/scanner, with wireless Internet connections. In addition, the Conservancy helped fund the digitization of more than a century of historic Bronxville-area newspapers that are being posted online at Hudson River Valley Heritage Historical Newspapers. 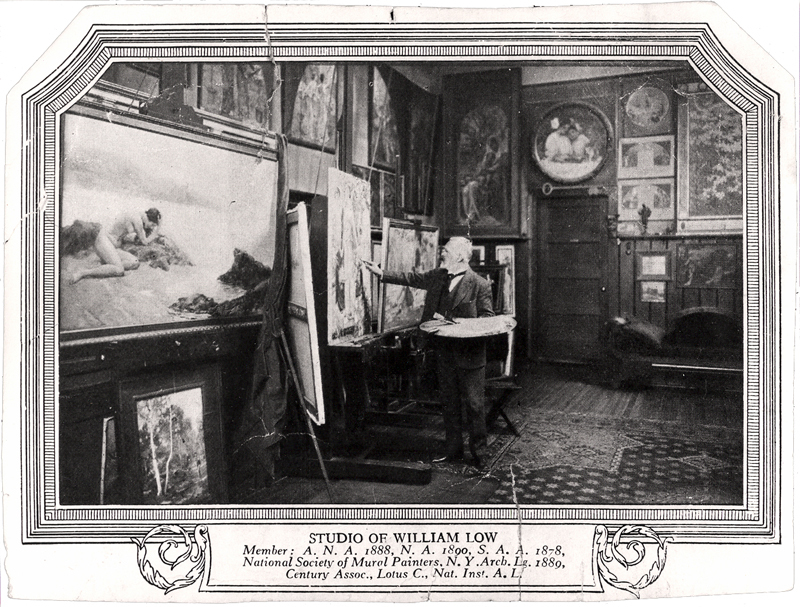 The Conservancy also underwrote the creation of two photograph collections of modern Bronxville: a beautiful portfolio of professional color photographs of modern Bronxville, in print and digital form, by Judith Watts Wilson, and a series of black and white streetscape images by photographer Fielding Bowman Other gifts include the reframing of a painting for the turn-of-the-20th century artist Anna Winegar. Who knows what the future holds in store for this village? The “Bronxville school”[of artists] may yet have its exhibition hall, and excursion trains be run on the Harlem to view their works. Meanwhile, [the artists] may be counted among the most enthusiastic residents of Bronxville … generally [having] conducted themselves as good citizens, while their fame, which is widespread, constitutes a valuable asset for the village. To celebrate that legacy, and honor and remember Bronxville’s well-known Lawrence Park art colony, the Conservancy is acquiring representative examples of the artists’ works. Whether the art was created while the artist lived in Bronxville, depicting local scenes, or is simply illustrative of the artist’s craft, this growing collection is part of an on-going research effort by the Conservancy’s Art Committee. As a tenth anniversary gift to the community, an art catalog was created to accompany the Bronxville Artists & Friends: Legacies Past and Future exhibit held in the fall of 2008 at the OSilas Gallery at Concordia College. 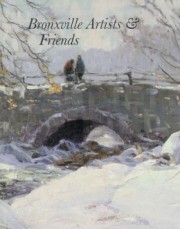 It is one of the most comprehensive publications ever on the works of Bronxville artists.